Thanks to True Value for sponsoring this post as part of its DIY Squad. Hi everyone! I hope your Christmas and holidays were fabulous and filled with wonderful memories, food and presents. The holidays were a little rough for my family, as you may have read about in this post. I’m trying to stay busy by finally tackling some projects that have been on my to-do list since 2014. Better late than never, right? Our guest room closet has been a haven for random junk and clearance impulse purchases, and I am excited to announce we’ve finally wrangled that under control and it’s now a beautiful, functional storage space for us AND our guests. Right after Christmas I get the organizing bug like many of you do, so I’m pumped to show off this makeover. 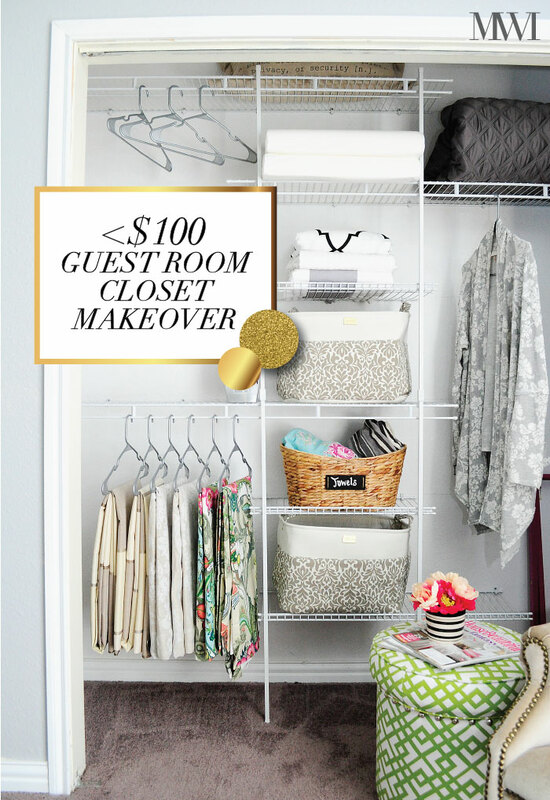 We looked at several closet systems that had hundreds and hundreds of pieces and cost thousands of dollars. There’s no way that was happening, so we did a lot of research and ended up spending about $80 or so and creating our own semi-custom solution. I found the perfect closet system online and it was to my door in a couple of days via free shipping! We loved the ease and function of the Closetmaid kit, but I wanted a few more shelves to make it really work for us. I did a lot of research and found that all of the Closetmaid accessories work really well together, so all I had to do was buy two extra 6’ shelves and cut them to size with a hacksaw, which is what Closetmaid recommends. I also did have to buy some extra drywall clips to support the shelves, but overall it was super easy, and once I put the little end caps on, you can’t even tell they were cut. Now I have three extra shelves and a CUSTOM closet…score! I won’t go through all of the directions, but I will give a brief overview of how we accomplished our makeover. I will say that we’ve put together a lot of furniture and other closet systems, and this one is AMAZING and easy to install. The directions are clear, make sense, and are achievable for any level of DIY-er. From start to finish, this project took us about three hours, and that includes my breaks to eat chocolate chip cookies and drink hot cocoa. Here’s what we started with…a plain closet with one giant shelf and closet rod. Not remotely functional, pretty or practical for a guest room at all. Once we emptied the closet, we removed the shelf and rod and got started! The first step of installing the Closetmaid system involved finding your center point to mark where your vertical holes would be drilled. You’ll make lots of lines with your level and mark your holes going horizontally, too, for the drywall supports. Pilot holes are a MUST when doing this type of work, and they’ll really make inserting drywall clips/anchors a breeze. In the photo below, you can see how all of our measuring and drilling helped us create the grid of clips that would ultimately support everything. Our drywall supports are 11” apart. Next, we took our shelves and hung them on the clips for a dry run to see if everything looked good and was level. We were thrilled to see it coming together. From there, we attached the three side brackets that came with the kit to support the larger shelves, again making sure we were level in both directions. The final touch was clipping on the two front support posts and we were done. Since this is a guest room and storage for my ever growing curtain collection, we wanted to leave plenty of space for guests while also utilizing the space for us. For our guests we have extra pillows, comforter, towels, linens and an iron and luggage rack. We left a few hangers and plenty of room for guests to hang up their clothing. For us, we have curtains hung and throw pillows and runners tucked away in bins. 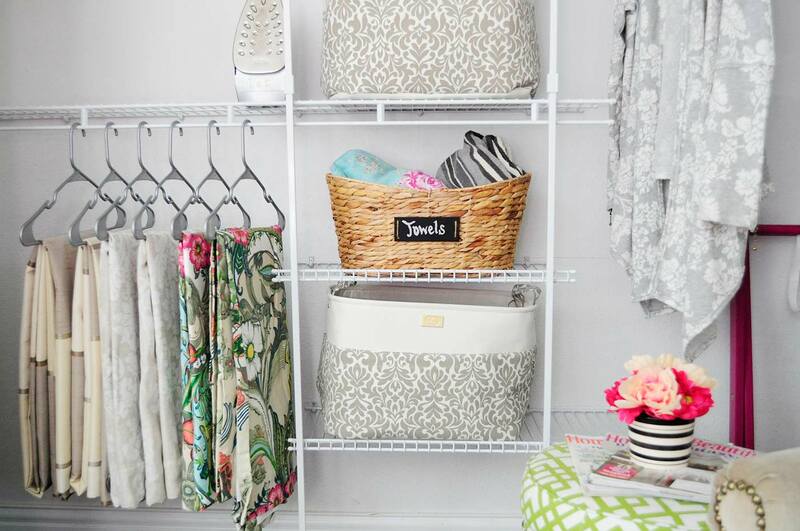 I shopped my house for the storage bins and basket. You forget what you have until you really dig deep in your closet. Overall, it’s a beautiful closet that will serve us well for years to come, and it adds value to our home for when it’s time to sell. I highly recommend using an organizing system to create your own DIY custom storage solution. My next project is working on the closet doors/trim to finally get the guest room finished, and I’ll be sharing that project with you in January. Make sure to come back tomorrow though…I’ll be sharing my top 15 posts from 2015. It’s been such an amazing year of blogging, and it’s so lovely to be able to share my ideas and projects with you. I truly love you all, xo! Hi Monica,Happy 2016! I love your blog! where did you buy the hangers? I like that they can be used to hang pants, shirts, and camisoles. Hi Monica,I love your blog! Where did you buy the hangers? I sure need this in my closet. Love it Monica! I'm working on my closet!! Love it, it really does look pretty and functional.